This roller assembly supports your boat's keel for easy loading and safe transport on your trailer. 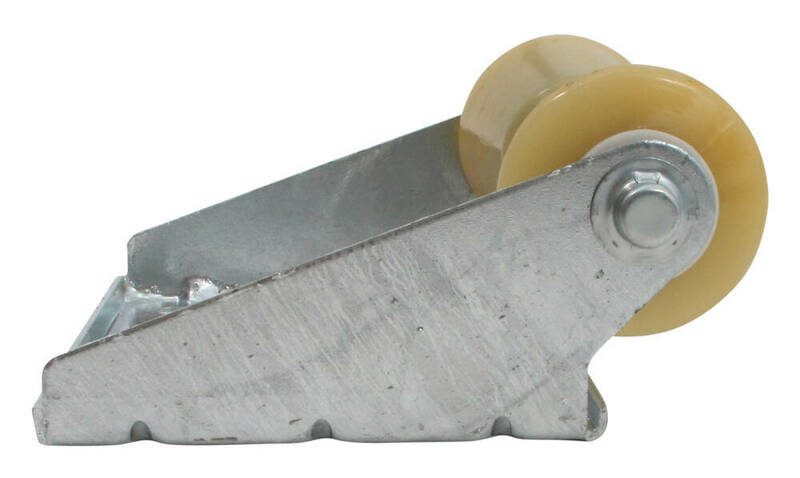 Its 8-inch, yellow TPR spool roller won't mark your boat, and the galvanized steel panel bracket has slotted mounting holes for adjustability. 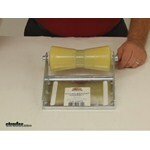 Call 800-298-8924 to order CE Smith boat trailer parts part number CE10453G or order online at etrailer.com. Free expert support on all CE Smith products. 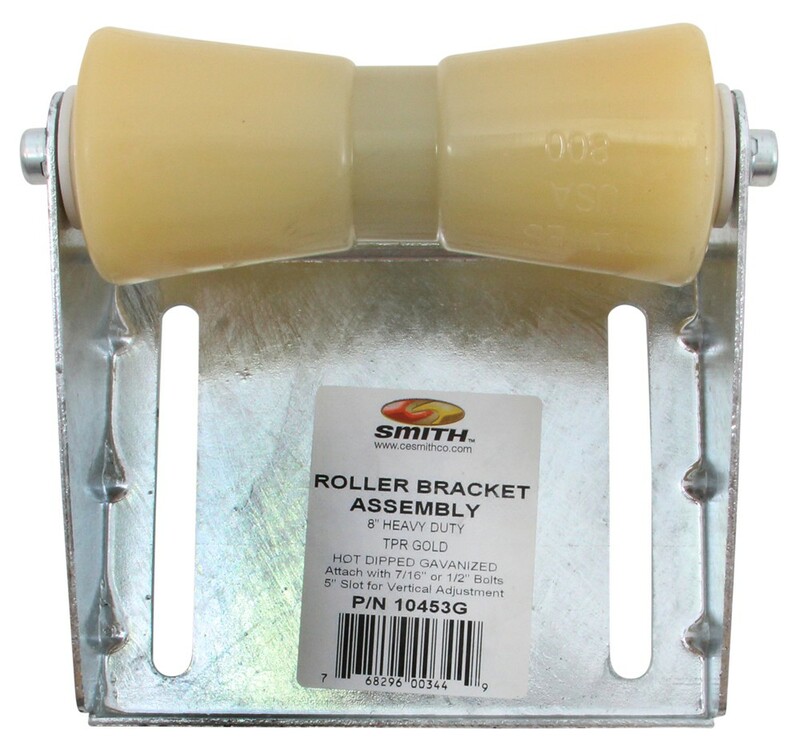 Guaranteed Lowest Price and Fastest Shipping for CE Smith Deep V Keel Roller Assembly for Boat Trailers - Galvanized Steel and Yellow TPR - 8". Boat Trailer Parts reviews from real customers. Video of CE Smith Deep V Keel Roller Assembly for Boat Trailers - Galvanized Steel and Yellow TPR - 8"
Today, were going to review part number CE10453G. This is the C.E. Smith, deep V keel roller assembly for boat trailers. This roller assembly helps support your boats keel for easy loading and safe transport on your trailer. Its eight inch yellow thermal plastic rubber spool roller wont mark your boat, and the galvanized steel panel bracket has slotted mounting holes for adjustability. This is typically installed upright on the rear and middle cross members of a boat trailer. A keel roller panel bracket assembly helps to keep the boat moving while it is being loaded and to stabilize the keel. The deep V keel roller support, the deep v keel roller will support your boats keel as it sits on the trailer. It eases the loading and unloading of the boat. And it helps to absorb road shock while the boats being trailered. 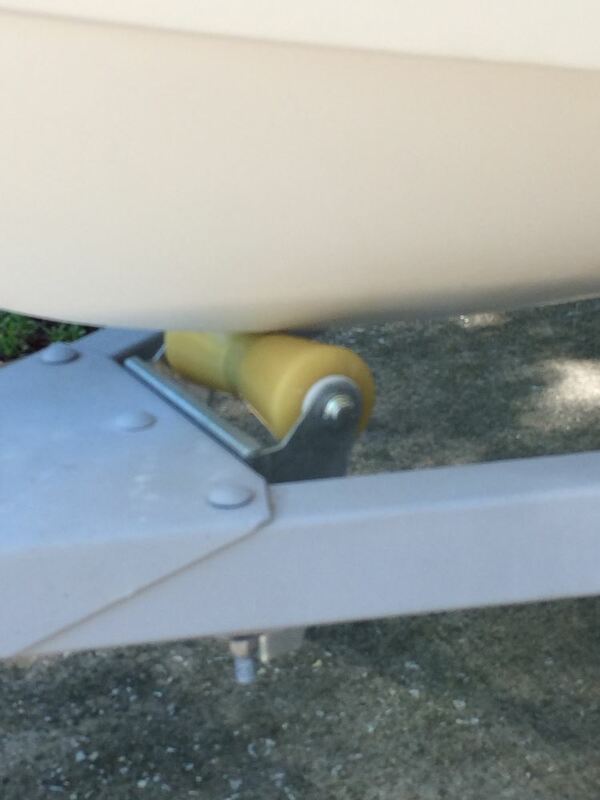 The panel bracket lets you bolt your roller assembly on to the front of your boat trailer. It does have the slotted mounting holes that allow you to adjust the position during installation. And when installing it, it does require half inch or seven sixteenths fasteners, which are not included. This is a sturdy galvanized steel bracket which resists corrosion. The galvanized steel parts are hot dipped in zinc, after being stamped. And this creates a coating that is typically three millimeters to five millimeters thick. And this thick all around coating allows the galvanized steel products to provide years of use without rusting or corroding. It does have on each side there are three gussets, so for a total of six gussets which will provide extra strength by stiffening the bends. The roller itself is a yellow TPR roller, which stands for Thermal Plasticized Rubber. Thisll deliver superior, long lasting performance. The TPR material is a non-marking, stronger than rubber and softer than polyurethane. This part is made in the U.S.A. I do want to give you a few dimensions on this. The overall roller length is going to be eight inches. The shaft diameter that it rides on is five-eighths inch shaft diameter. The dimensions of the mounting slots are half inch wide. Lets do it this way. Itll probably be easier to see. Its going to be half inch wide and five inches long. The space between them, centre to centre is six inches. And this part is made in the U.S.A. And that should do it for a review on part number CE10453G. End of AudioDuration: 3 minutes, 13 seconds . Order: RelevanceNewestRating - High to LowRating - Low to High This roller assembly supports your boat's keel for easy loading and safe transport on your trailer. 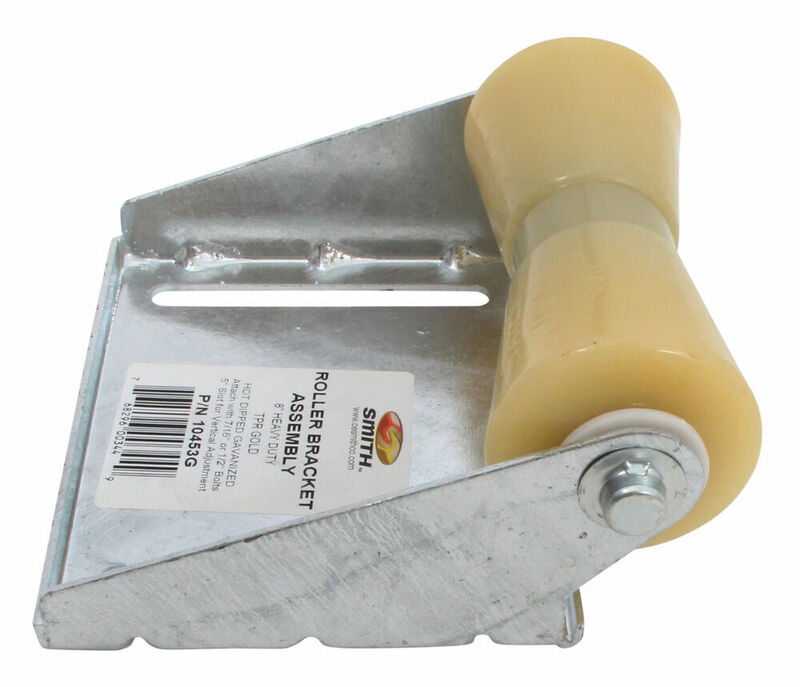 Its 8-inch, yellow TPR spool roller won't mark your boat, and the galvanized steel panel bracket has slotted mounting holes for adjustability. After a year this roller is still performing great after launching and loading over 30 times. Keeps on rolling, no rust, a very robust product, no flat spots in the polymer part. On the CE Smith Deep V Keel Roller Assembly, # CE10453G, on the larger section of the roller to the mounting plate measures 4 inches tall. At the center of the roller to the mounting plate the measurement is 3-1/16 inches tall. The CE Smith Deep V Keel Roller Assembly for Boat Trailers - Galvanized Steel and Yellow TPR - 8" # CE10453G has a height dimension of 5-3/16 inches. The Bunk Rollers like the Boat Trailer Deluxe Roller Bunk - 4' Long - 10 Sets of 3 Rollers - by Dutton-Lainson # DL21740 are 2-1/4 inches. Any of these product can be mounted horizontally if you will be loading from the side.